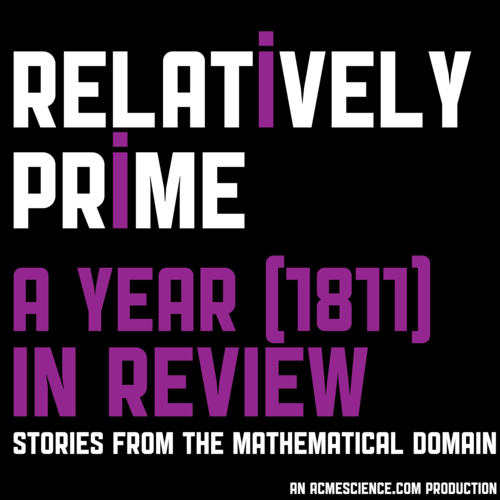 Samuel has been in the middle of a big move this month, more on this in upcoming episodes, but they did not want you to be without a mathematical podcast to end the old and start the new year so here is a year in review episode (with a special twist)x from Samuel and Peter Rowlett’s old podcast Math/Maths. In a traditional move for the start of January we attempt a review of the year. In an untraditional move, we choose the year 1811. Samuel and Peter weren’t able to speak directly because of the ongoing tension following American independence and the brewing Anglo-American war of 1812, but they cover some mathematical hot topics and the work of several contemporary mathematicians, including Carl Friedrich Gauss, Joseph Fourier, Mary Sommerville, Joseph-Louis Lagrange, Pierre-Simon Laplace, Siméon Denis Poisson and Marie-Sophie Germain, plus the tale of a mathematician born this year: Évariste Galois.